Chesterfield failed to cut the gap between themselves and safety with yet another defeat, as they went down 3-1 at Northampton Town. The travelling Spireites’ faithful watched on as Gary Caldwell’s side lost for the 18th time in the league this season. 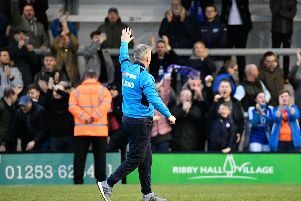 Defeat ended Chesterfield’s impressive unbeaten record, nine games, against their opponents as they suffered their first loss to Northampton in a decade. The visitors had the chance to move just a solitary point from 20th place at Sixfields. However, a first-half brace from Cobblers’ midfielder John-Joe and a goal from Marc Richards leaves the Spireites with just one league win in their last eight outings. David Faupala celebrated his birthday with his first league goal, as well as ending the Spiereites’ agonising 479-minute wait for a goal away from the Proact, but it was only a mere consolation for the visitors. Shot-stopper Ryan Fulton missed the trip due to illness, with Lloyd Allinson starting. Welsh striker Ched Evans is in the middle of a barren run, having failed to find the back of the net in his last eight, and found himself dropped to the bench - with Kristian Dennis starting up front. It took Justin Edinburgh’s side just 12 minutes to strike against the struggling Spireites. O’Toole opened the scoring as he rose highest to divert Kiram Boateng’s cross past Allinson. After going behind the Spireites started to feel their way into the game. Dion Donohue played Jon Nolan in behind over the top, with Adam Smith snubbing the danger with a decent save. Wing-back Sadiq El-Fitouri prospered down the right with his searing pace, but Faupala could only head over the bar. Just before the break Keshi Anderson’s shot was deflected into O’Toole’s path as he doubled his tally with a tap in. And things got even worse after the restart. Three minutes after the break Richards got on the end of Matt Taylor’s free-kick for the hosts’ third. Just before the hour Frenchman Faupala reduced the Spireites’ arrears. Donohue surged down the left and squared the ball for the Manchester City loanee to fire home. A long ball found its way to Michael Smith, who could only hit his effort wide when he could have put the game to bed. Evans came on the bench just after the hour and 10 minutes later he cut inside and struck over the bar. Allinson brought down Richards late on, although shouts for a hosts’ penalty were waved away. Northampton: Smith, Eardley, Nyatanga, Diamond, Buchanan, O’Toole, Boateng (Anderson, 87), Anderson (Wylde, 84), Smith, Taylor, Richards. Unused subs: Cornell, Beautyman, Phillips, McDonald. Chesterfield: Allinson, El-Fitouri, Evatt, Anderson, Jones (Mitchell, 45), Gardner (Martinez, 45), Grimshaw, Nolan, Donohue, Faupala, Dennis (Evans, 62). Unused subs: Brown, Duke, Hird, Simons. Scorers - Northampton: O’Toole 12, 42, Richards 48; Chesterfield: Faupala 54.